The landscape was breathtaking and it was a great place for walking and enjoying the outdoors. Dolphins, porpoises, seals, otters and puffins can be seen in the water. However, one of the most exciting things is the range of birds of prey that you can see- if you’re lucky. Golden eagles, white-tailed eagles, kestrels and buzzards can be spotted and there are several places that offer wildlife-spotting boat trips. I went out on one of these boats and they took us to see a white-tailed eagles nest which had two chicks inside and then threw fish off the boat so that the eagle swooped down to the water to catch the fish and we got a fantastic close-up view. It was really breathtaking to see as they are huge and magnificent birds with an enormous wing span. 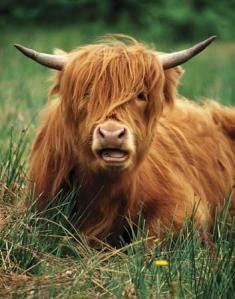 I’ve seen a couple of pop singer and rocker’s steal that cow’s hairdo style.